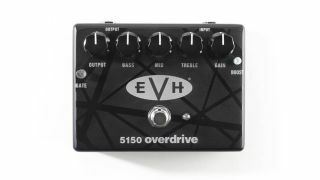 First came the phaser, followed by the flanger, then the wah… and now Eddie Van Halen finally has a signature overdrive pedal to his name in the form of MXR's EVH 5150 Overdrive. Utilising multiple MOSFET gain stages, combined with a three-band EQ, the 5150 Overdrive promises versatile valve-like tones through all kinds of amps and speaker cabs - including the "whole spectrum" of EVH tones, from Eruption to A Different Kind Of Truth. Elsewhere, a boost switch delivers extra gain and compression, while a built-in Smart Gate circuit limits noise - the pedal also offers true bypass switching and is powered by a nine-volt power supply. The MXR EVH 5150 Overdrive is available in the UK from November/December 2015 for £174.99 - check out Jim Dunlop for more.